I'm back with the ladies of Blogger Tribe for our weekly recap/linkup! What a week! Dan and I were stricken with a terrible stomach flu earlier this week, to the point I even missed work. It was horrible, and I can't remember the last time I was so sick. I didn't blog much as a result, as my spare time was spent taking care of Dan or the apartment or something to that end. Woof. We also got a little bit of snow, which meant most people were home on Friday. Weird, weird week. REDOING... chores around the apartment. Our house was super clean last Friday, but then the stomach flu hit me Monday, and all of that hard work was undone as we wallowed and tossed blankets and things all over the place. So not only did I have to go around disinfecting, but we have to wash linens, towels, and blankets, and clean it all over again. I usually try to clean something every week, but not EVERYTHING. MAKING... poor food decisions, LOL. Now that we're recovered from stomach flu, it's famine to feast. Last night we baked these brownies topped with cookie dough, DELICIOUS. We want to eat everything, after days of Gatorade and bananas and broth. CHOOSING... which cookbook to read! I love reading cookbooks, which I've mentioned here before. Many of them are filled with stories, but sometimes I just like to read through recipes for ideas on ingredients and techniques. I got some for Christmas, so I'm still going through them. I am in love with Molly on the Range, and this Seoul Food cookbook is one of the best I've seen for Korean food in terms of organization and contextual info. CONCENTRATING... on nothing at all. I'm scattered all over the place this week, flitting from one things to the next. I can't concentrate! APPRECIATING... soft bathrobes and blankets. I love the synthetic fabrics out there now that feel like luxurious fur and fleece. I might be cuddling highly flammable material, but gosh it feels good when you're sick. Oh, and you know what also feels good? Using the last of your homemade meatballs to make grown-up Spaghetti-Os. On the Blog: I only wrote one blog post this past week, as I don't have much in the queue. That said, our meal at Jeff Ruby's Steakhouse was amazing and worth writing about! On Twitter: I went to get my favorite doughnuts, and I shared them with my husband. Lucky guy! On Pinterest: I am a little obsessed with the idea of being able to perfectly ice a cake. On Instagram: Sometimes your Bitmoji tells it better than you can. Shopping: I'm looking for the perfect spice organization solution for my cabinet. The old system I used was discontinued. Any tips? This one looks interesting, like I could put a bunch in the cabinet that way. 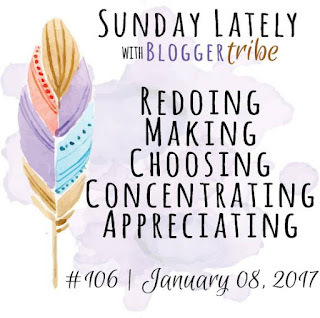 Sunday Lately is a weekly linkup presented by the Blogger Tribe. Next week's themes: Thinking, Finding, Allowing, Insisting, Repeating.